Recorded in their natural habitat, Solar Bears’ Rian Trench and John Kowalski, hailing from Wicklow and Dublin respectively, have come down from their studio in the Wicklow mountains bearing a masterfully crafted sophomore LP. Their debut “She Was Coloured In” turned heads in 2010 and garnered much critical praise. Since then Solar Bears have been popping up sporadically on the Irish and international music scene, on stage and on remixes for the likes of Keep Shelly In Athens and How To Dress Well. 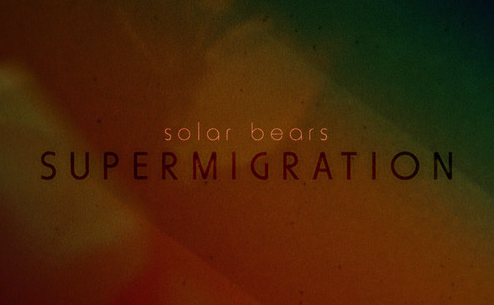 Having only released one EP since “She Was Coloured In”, “Supermigration” arrives to an audience with a strong appetite for Solar Bears’ distinctive blend of musical styles. Like a movie that unfolds in reverse chronological order, the album opens with a defining, haunting melody, which reverberates around a well worn grand piano before being sucked up into the sonic outer space that the proceeding album explores. Later, on the “You And Me” interlude the same melody is replayed on a warm echoing synthesiser as well as being referenced in the melody of “Love Is All”. This melody serves as a grounding element in the otherwise cerebral, often extraterrestrial odyssey that the record is. The album is well balanced between more subtle and delicate tracks on the one hand and driving, rhythmic ones on the other. “Cosmic Runner” is one of the strongest and most powerful on the album. But when the album does have these more danceable moments, the attention to detail is never neglected. On “Cosmic Runner” behind the driving synths, arpeggiators and rhythmic echoes that define this track are airy swelling synths that pay homage to Moon Safari era Air. This is a visual album and these heavier tracks act like climactic moments on a cinema screen. This is exemplified in “Komplex”, which conjures visions of space explorers sweeping over unexplored terrain. Scatty high hats bounce around in time with the echoing melodies maintaining the momentum that is rarely neglected throughout the record. At well chosen moments on the LP, the lights are dimmed and gentler pieces are introduced, namely on the two tracks which feature guest vocalists, “Alpha People” and “Our Future Is Underground”. Greek duo, Keep Shelly In Athens, take the stage for an energetic but restrained, psychedelic ballad and later when the record is starting to get very spaced out and any connection with anything human is becoming tenuous, Beth Hirsch’s warm vocals offer a momentary change in atmosphere. “The Girl That Played With Lights” marks a turning point on the album, beginning with a panning arpeggiator quaking around the speakers before what sounds like a live band materialises. This particular track reminds us of how Solar Bears occupy an unusual place between that of a live band and that of producers. While the duo are no doubt embedded in the Irish electronic music scene and are very much involved with the Irish vanguard of beat music producers, they are producing music that explores sounds and textures far outside the scope of many of these prolific young artists. And while we have seen an explosion of incredibly talented Irish producers in recent years, it is very rare that such a cohesive album is released. “Rainbow Collisions” winds the album down, rounding off what is a very solid and coherent piece of work. As the final track plays out you almost get the sense that the credits are rolling. And just as the movie ends there is a final cut to the two producers, the protagonists in this epic, as they fly off into the sunset with only the subtlest glint of pride in their eyes as they wrap up an album that is instantly timeless. 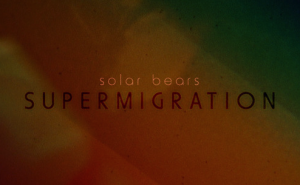 Catch Solar Bears live at The Button Factory on April 26th when they will officially launch the Supermigration album. Admission: €10.